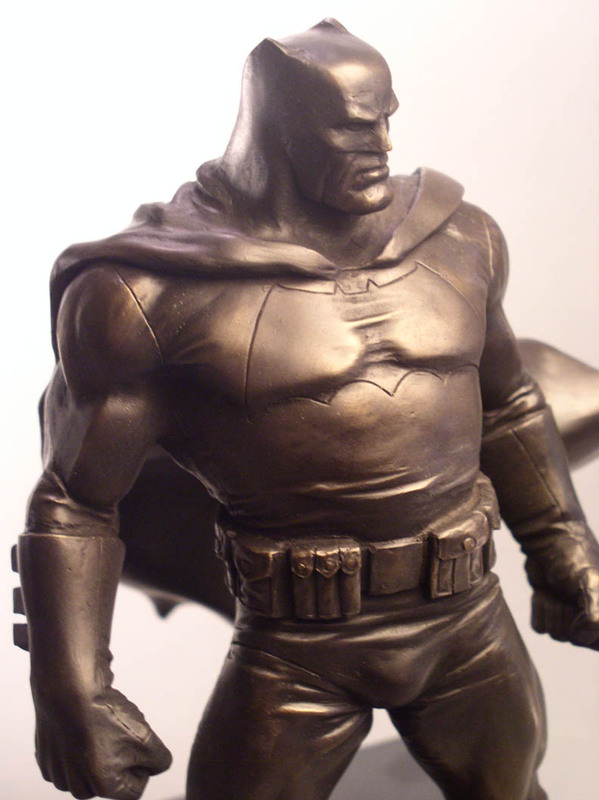 Occasionally I like to share items on my blog from my personal collection of books, posters and statues so today I chose to post the first sculpture that began my obsession with Batman statues. 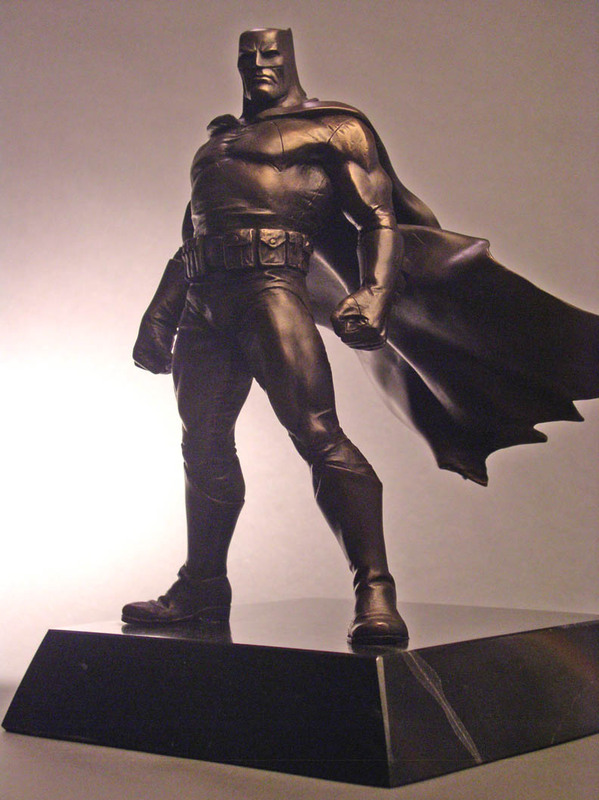 Released in 1996 by DC Comics to celebrate the 10th anniversary of the 4 issue prestige format comic book series, The Dark Knight Returns by Frank Miller, the statue measures 7.5″ tall and is made of cold-cast porcelain. It retailed for $200. 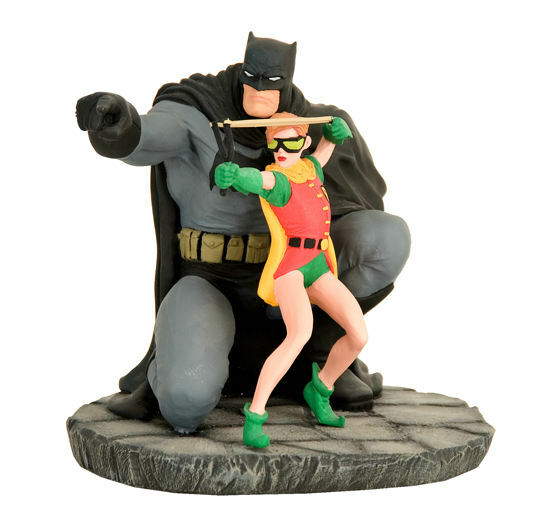 This beautiful collectible features an older Batman teaching his new protege, a female Robin how to fire a slingshot. 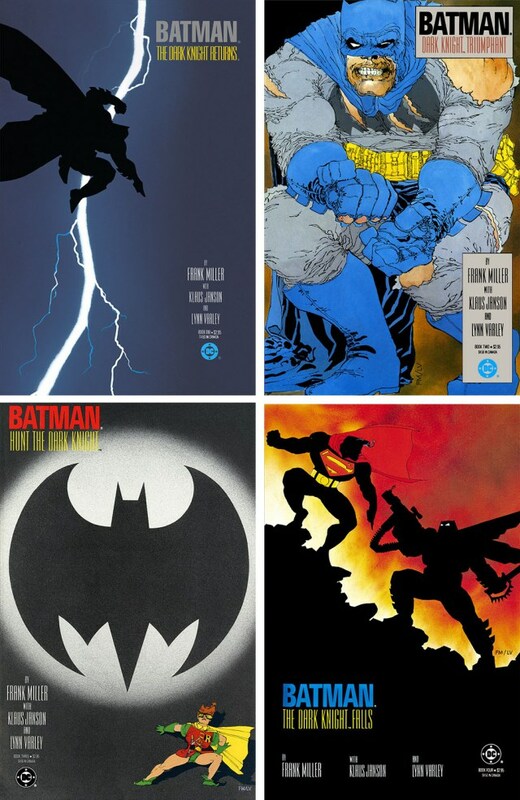 Limited to an edition of 5,500, the statue was sculpted by William Paquet and designed by Frank Miller based on the signature page art from the Dark Knight Returns limited signed edition published by Graphitti Designs. Paquet is the Creative Director at Quarantine Studio, a company that produces limited edition collectible statues. 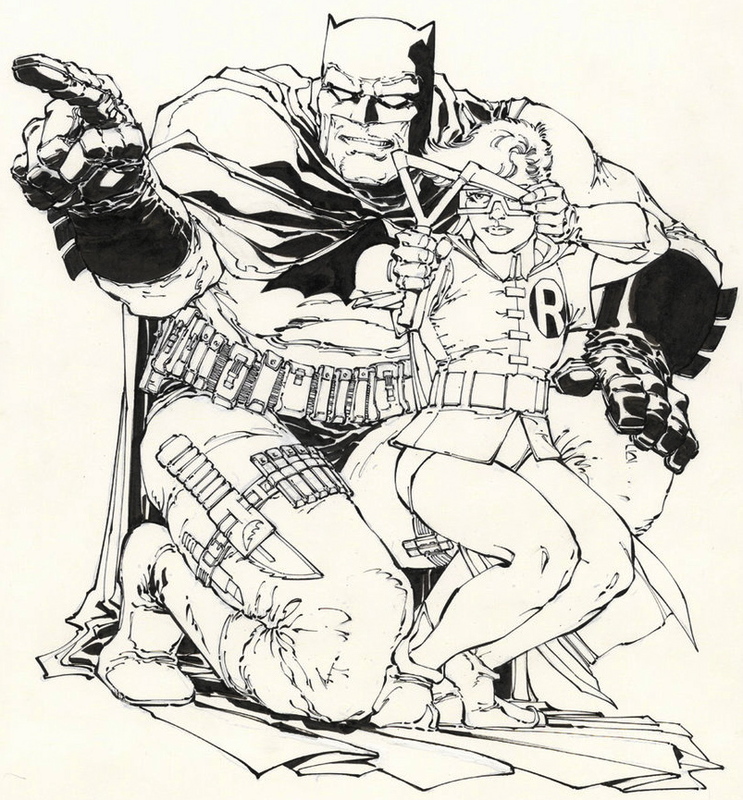 In researching, this post I stumbled upon another Dark Knight Returns statue that was also sculpted by William Paquet. 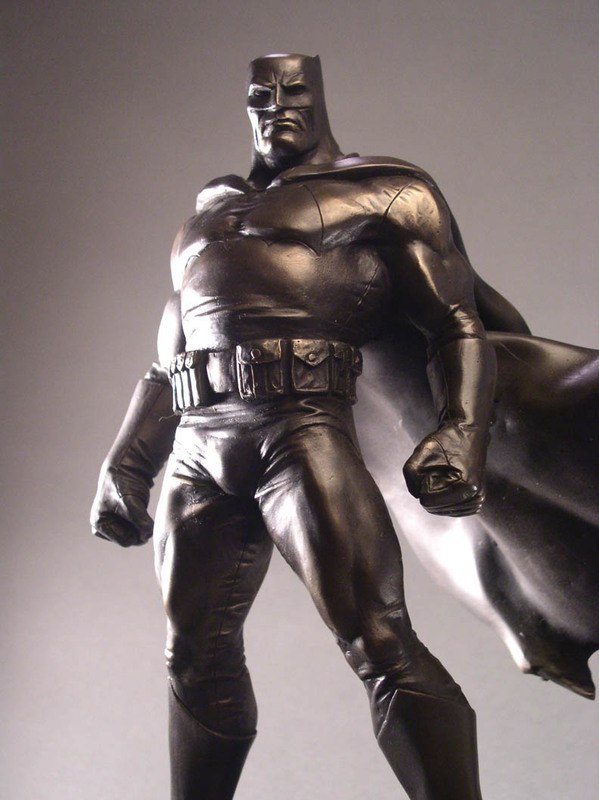 The statue which is made of bronze and granite measures 14” tall including the base and weighs 31 pounds. When was the statue created? If there are 3 statues and you have one, who owns the other 2? Will it ever be mass produced? What was the reason the you created the statue besides being cool? I loved Miller’s aesthetic and had a client with the desire and money to make it happen. Where do you keep your statue? Home, office, display case or in a hidden secret panel? So to sum it up, the statue is awesome, highly desirable, unavailable, will never be reproduced and there are only 3 in the world of which 2 belong to unknown people. That my friend, is a conversation piece! This is the kinda thing the lost wax technique was made for over a billion years ago.